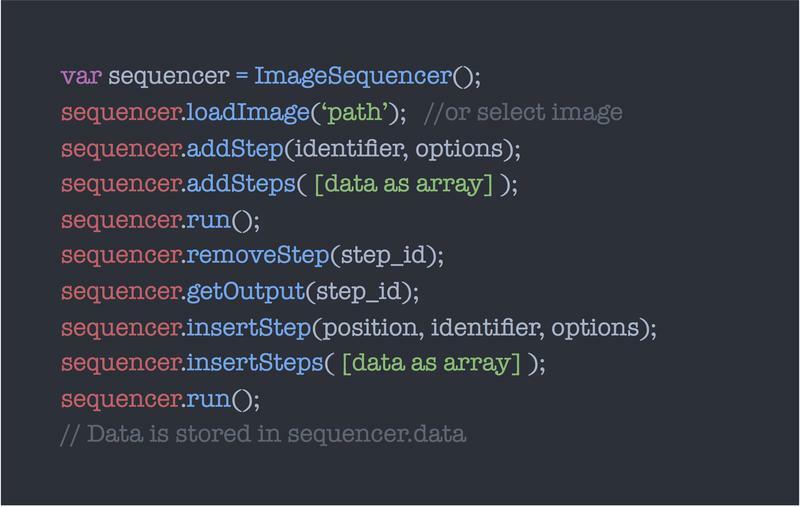 Image Sequencer is in early-development phase. The core functionality (addition of a step, removal of a step, insertion of a step, etc.) is being implemented. There are a few modules present. Calculations aren't GPU accelerated. As a result, there is a lag when images larger than 700KB are handled. 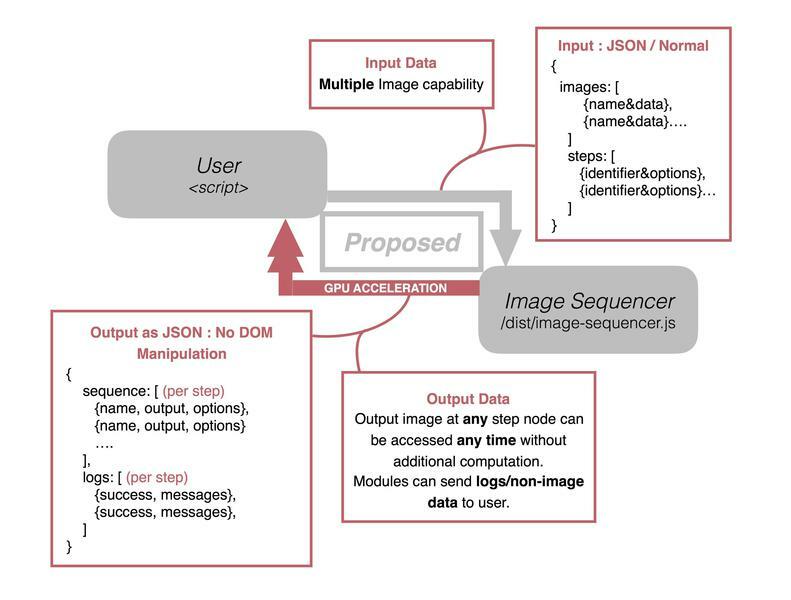 The aim of my Project is to expand the module library by implementing powerful and useful image processing modules (As listed at the end of this proposal) with possible integration with GPU.js for enabling GPU-backed calculations and hence enhance performance, reliability and speed. And, ultimately, to develop Image Sequencer as an importable library for image manipulation. Also, support will be developed for JSON input. This is explained below in detail. Long call syntax --- This can be improved upon. No JSON support --- This makes integration of Image Sequencer into large-scale projects impractical. Time Lag --- When a step is added, sequencer.run() runs through all the steps --- this creates an unnecessary time lag. The outputs of different steps aren't stored and hence can't be accessed at will. The library simply injects the output images into the UI. No functionality for modules to send logs or non-image data to user. My project aims at restructuring the code and expanding the module base which will lead to faster and neater usage. Completing the core functionality --- addStep/s, removeStep/s, insertStep/s, getOutput, stepLog. Supporting JSON type input & output to enable easy use and shorter call syntaxes. Enhancing speed with the help of GPU accelerated calculations using GPU.js. Accepting logs / non-image outputs from modules. Implementing the core functions addStep/s, removeStep/s, insertStep/s, getOutput, stepLog, complete with JSON input/output support. This will include most of the restructuring work. ImageSelect.js will no longer have a 'special module' status as it currently does. Support will be added for handling multiple images. User would be able to access data relating to any step on any image at will. 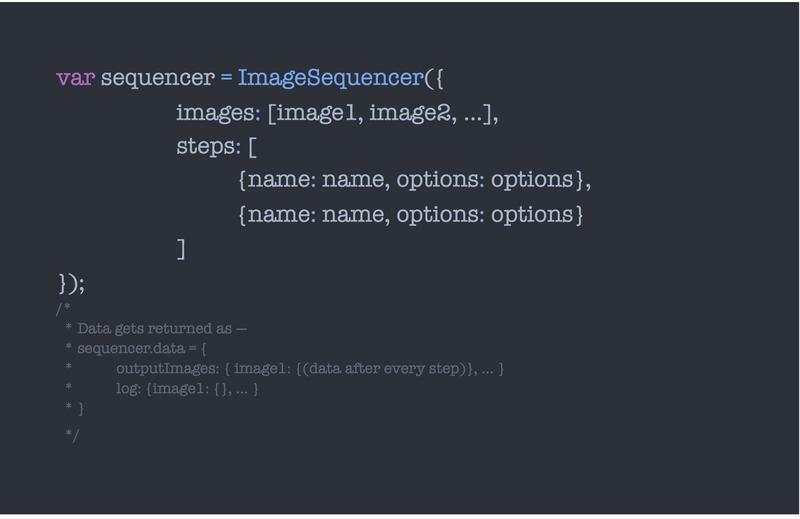 GPU.js will be integrated with Image Sequencer. So that the matrix calculations of modules are GPU accelerated, whenever possible. This will include changes in /src/PixelManipulation.js and other files. Community review for Core Functionality and JSON. Module logs will be returned to user. A method getOutput will be introduced. This will enable modules to send non-image data to the user. For example, A QR Code reading module can send detected data to the user. Community review for Multiple Image Support and GPU.js integration. Modules in the list of module candidates will be implemented along with Additional modules as suggested by the community. Also a special module, 'Color Space' will be implemented which changes the colour space of the image to user defined functions of r, g, b, a.
Demo will be reworked, with a better UserInterface.js. UserInterface.js will be made demo-independent --- It's function will be independent of the implementation where Image Sequencer is being used. Community review for Module Implementation. This period will be for bug-fixing, goal-expansion, and implementing community suggestions. Also, My college starts functioning from July 31. So my contribution might decrease a bit in this period. This will officially conclude my work for Image Sequencer, though I'll still be associated with the project and contribute to it, as and when possible. I am a Web Developer and a Python enthusiast. I have worked on many technologies till date and have done that over the past six years. Basic Functionality : Adding shapes, text, images, background removal form imported images, flipping objects along X and Y axes. Basic Functionality : Download/Update Lecture slides from our college portal, Nalanda and store them on the user's laptop. Front-end deployment frameworks used : jQuery, Angular.js, D3.js, Bootstrap, Materialize, Fabric.js. This list is compiled from the original Readme.md of Image Sequencer and my own online searches. Sorry, there was some formatting error earlier. I have fixed that now. Was working fine when I pasted it, but got distorted upon submission. Hi, this is very thorough and impressive, thank you! For GPU, I think we should make this optional, if possible, and maybe we need to think about where swapping in a GPU functionality should occur? Inside each module, I guess? Some uses may not have a GPU - for example on server side use. Likewise, JSON should be optional -- perhaps JSON could be passed into the constructor method of ImageSequencer. But I think simple function-based calls are very important as people may want to simply interface with a UI, or with another program using them, without having to assemble a more complex JSON object to use the system. For example, the demo uses a DOM click event to add a step. For output data, I think there's a balance to be struck on whether modules should be stateful -- like, do they store their last output? Or is that handled at the level of the sequencer, so that modules can remain very simple? I think I am leaning towards the latter, but tell me what you're thinking. Haha, ok - your examples actually address most of my questions. Great proposal! can you talk more about this? Regarding the GPU, yes. Some users may not have a GPU. We'll have to use a JS fallback for then. That shouldn't be a problem, as, the module which I am thinking of implementing, GPU.js, does that by itself. Inside each module, I guess? Not really. Modules like GreenChannel, NdviRed won't need one as the matrix calculations are done in PixelManipulation.js. So, implementing GPU-backed calculations in PixelManipulation.js would suffice for quite a few modules. And for the rest, as you said, integration will have to be done in every module. Yes. That's what I was trying to say. I guess my explanation isn't good enough. Maybe I should rephrase parts of my proposal a bit. As far as statefulness is concerned : I know -- the idea of 'Image Sequencer' does make us intuitively think of a stateless model. Like the current one. But, that is something which works for the demo, because we inject a DIV in the DOM when we call draw(). This is something which wouldn't work for other implementations. The aim of Image Sequencer is to enable the user to make comparisons and document different steps. So if we are able to only provide the last step, it would take away Image Sequencer's USP. So we have two options : 1) Store the output for every step. 2) Run the sequencer whenever we want an intermediate output. The second option has a greater time complexity. So In my opinion, storing the output after every step is a good solution. What do you think about this? Yes, I am working on that part now. I am trying out the node.js based implementation and fixing it up. I'm sure we'll be able to fix that issue. Testing shall be an important part, undoubtedly. 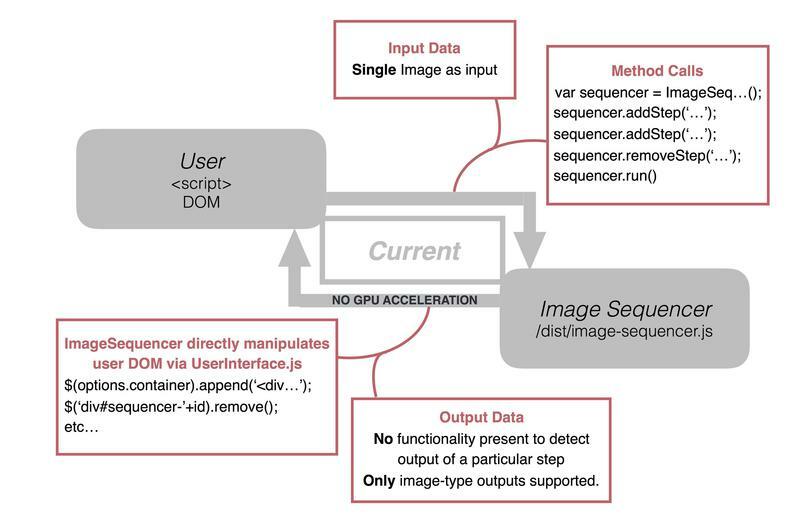 Image Sequencer promises to run a sequence over one or more images. Currently, for one input image, one instance of Image Sequencer is needed. I feel this could be better implemented by storing all the images in one module itself. Using the same steps array and same functions. @warren so should I make any other changes? Hi, perhaps you could present a rough schedule and ordering of how you'd approach the projects? Thank you! @warren I've added a rough schedule. Does that look fine? Okay! Although, this draft is a few edits behind the current one. I've submittted an official draft via the SummerOfCode website. I'll update this one too. I'm having issues editing it here. The editor isn't loading at all. Hmm, can you file a bug? If it doesn't work, no worries, I'll check both places, but let's figure this out! I had a look. The editor did open, but took a lot of time to open. Maybe it was a connectivity issue. I'll update this soon.